Gunners resting between alerts at a heavy AA post, 1943. Illustrious returns to the Grand Harbour. Preparing for the night in the crypt of St Augustine’s, Valletta, 1943. No time to lose – Soldier dockers unloading a convoy during a raid, 1943. The REs leaving Malta after No time to lose – Soldier dockers unloading a convoy during a raid, 1943. three years, 1943. Malta, the Hypogeum – People of Paula sheltering during a raid, 1943. 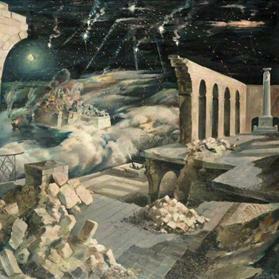 While conducting research on World War II and St Augustine’s church in Valletta, I accidentally stumbled upon two paintings, one in oil on canvas, connected to life on the island during those turbulent and devastating years. The artist, then unknown to me, was Leslie Cole. I later learnt that he had painted various studies of local scenes and portraits of individuals, but what fascinated me most were his war scenes of Malta. The first painting, titled Preparing for the night in the crypt of St Augustine’s, Valletta, depicts life in the vaulted undercroft or crypt (kannierja) of St Augustine’s church. Women are shown preparing the large iron-framed beds for the night and others are praying by an altar. The other painting, titled The dormitory under St Augustine’s, Valletta. People beginning to gather in the evening, is in watercolour and shows women talking and preparing for the night. Also shown in the crypt are the flagstoned graves and marble slabs on the floor. 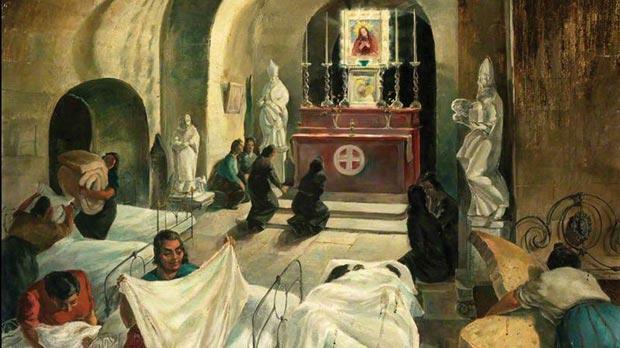 These scenes portray life in the kannierja during World War II, when locals from the Mandraġġ area of Valletta and its environs sought refuge beneath the sturdy vaults that form part of the church’s foundations. Although the church was hit by bombs in 1942 and the convent a year earlier, people still sought this underground refuge and made use of it and of the rock-hewn air raid shelter further below. Many of these people had lost their homes and possessions, which had ended as heaps of rubble, and had nowhere else to go. Cole was born in Swindon, UK, on August 11, 1910. He studied at Swindon College and later at the Royal College of Art in London, gaining a diploma in mural decoration, fabric printing and lithography. He became a teacher at the Hull College of Art in 1937 and later married Brenda Harvey. This was not her real name, and along with the fact that she had earlier been the star witness in a controversial court case, was kept a secret until well after Cole’s death. With the outbreak of war in 1939, Sir Kenneth Clark, director of the National Gallery in Great Britain, launched a scheme to engage the nation’s artists in the war effort and the War Artists Advisory Committee (WAAC) initiated recruitment. In 1940, a very eager Cole applied to enlist but failed to be accepted. Instead he decided to follow other fellow students and enlist in the Royal Air Force but he was discharged on the outbreak of the war due to health reasons. Unshaken, Cole made a second attempt, to become a war artist. He sent the committee examples of his powerful figurative lithographs reflecting the war situation in his home town of Swindon and in Hull. His capabilities were immediately recognised, particularly for his fine watercolours, many in a style influenced by Eric Ravilious. He was accepted as a salaried worker with the commissioned rank of captain (honorary) in the Royal Marines and obtained permission to record the domestic war effort and damage sustained by Britain through enemy action. 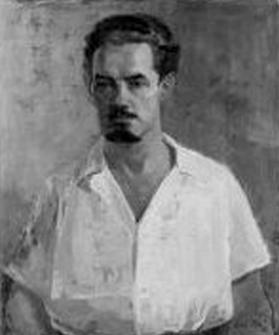 Determined to witness the events of the war and to record them through painting, Cole accepted to cover the theatres of the war and travelled to Gibraltar and Malta in May 1943 until ending his commission in November after the capture of Pantelleria. In July 1944 he received a second commission with the Royal Marines Command in Cairo, followed by a transfer to the War Office. His postings recorded the Greek People’s Liberation Army’s efforts in Greece, followed by the Normandy D-Day offensive in June 1944, and Germany, where he witnessed and captured on canvas the horrors of the Bergen-Belsen camps. His work was able to vividly portray the sufferings and death, which led him to be one of four official artists chosen to be present at the first liberation of a major Nazi concentration camp. Later he was taken to the Far East, where his paintings again recorded the miseries of the Japanese prisoner-of-war camps in Burma and Singapore, in particular the portrayal of the conditions of women and children. After the war he taught at Central School of Arts and Crafts and Brighton School of Art. He continued to produce brilliant work, and two of his paintings, showing London pub scenes in the 1950s, turned up when The Antiques Roadshow visited Bodnant Garden, North Wales. Cole and his wife never had children and remained married until his death in 1976, aged 66. Harvey died in 2003. In January this year, Malcolm Yorke, author of the books on Edward Bawden and Edward Ardizzone, researched and published the first ever book on the life and work of Cole, featuring some 110 of his paintings, mostly in full colour, as well as photographs and sketches. While in Malta, Cole had endured the same hardships and cruel conditions the islanders were being subjected to, especially during the continuous air raids. He produced a number of striking paintings of various street scenes depicting the destroyed buildings, the people and their sufferings, the military, as well as the preparations for the invasion of Italy. His personages in Malta include Brigadier Sir Ivan de la Bere, then a lieutenant colonel in command of the 1st Battalion Dorsetshire Regiment then in Malta, Air Vice-Marshal Sir Keith Park, Air Officer Commanding, Malta, Major-General W. H. Oxley, General Officer Commanding Troops Malta, Major-General G.C. Kemp, Rear-Admiral Sir Kenneth Alexander Ingleby-Mackenzie and of Major L.R. Samut. Cole’s war paintings are even more valuable, and are included in some of Britain’s most important art collections. The Imperial War Museum in London holds 25 of Cole’s works, of which many were painted while he was in Malta. Another 70 are in various collections. Five include scenes of Malta that are at the Government Art Collection, London, three are at the National Maritime Museum, Greenwich, and one at the British Council. A major exhibition of his work was held at the Imperial War Museum in 1985 entitled To the Front Line. Leslie Cole: Paintings of the Second World War. The Royal Greenwich Museums is currently holding an exhibition of paintings at The Queen’s House titled War Artists at Sea, which features paintings and works by various artists, including Cole. In its collection, Heritage Malta has seven works by Cole that were a donation by the British Services prior to their departure in 1979. Five of them are character portraits or studies, and are housed at the National Museum of Fine Arts in Valletta. The other two depict military events – a draft sketch in pencil is exhibited at the National War Museum, Fort St Elmo, which shows soldiers making coffins and carving headstones during the war. 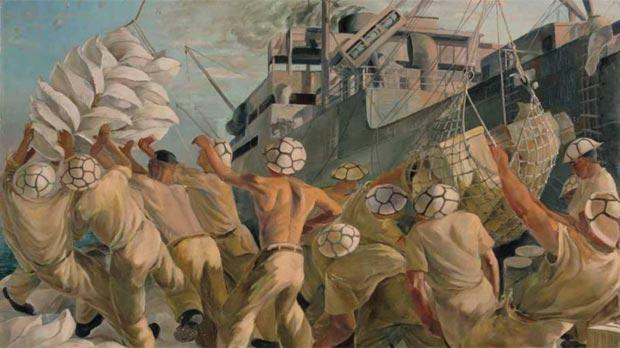 The other, titled Wartime Diving in the Grand Harbour, is at the Maritime Museum in Vittoriosa. The author acknowledges the assistance of Alexander Debono, Bernadine Scicluna and Lian Gauchi of Heritage Malta and of Saviour Grima in this research. Besides the two ‘St Augustine’ works by Cole referred to in the article, the following is a list of his ‘Malta paintings’ in British museums. HM Submarine Upholder leaving the base for the Mediterranean, 1943, watercolour. Malta: early morning. 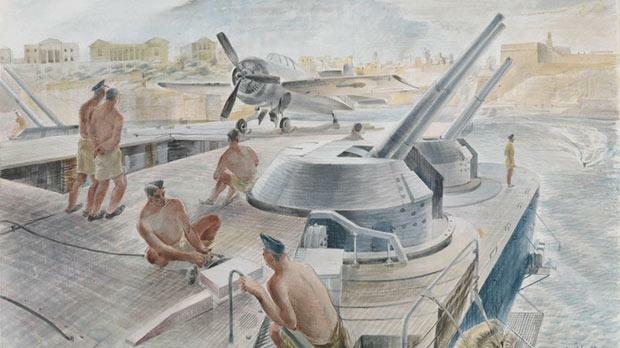 Looking towards Sicily from a balcony of the 45th General Hospital during an alert, 1943, watercolour. Malta: Citizens celebrating the victory at Cap Bon, 1943, watercolour. Maltese fishermen mending bombed dgħaisas and other boats, 1943, oil. A Malta Dockyard: The underground church with Rear-Admiral Kenneth Mackenzie, Mrs Mackenzie, two children and sailors, 1943, pencil. Floriana: ‘diffone’ workers mending the roof of the officers’ mess, 1943, oil. Malta – A few people sleep out among the debris, 1943. Malta convoy: Basutos deal with the overflow mail on the causeway, the Palace, Valletta, 1943, oil. Malta: No Time to lose – soldier dockers unloading a convoy during a raid, 1943, oil. Study for Victory Kitchen, watercolour-ink. 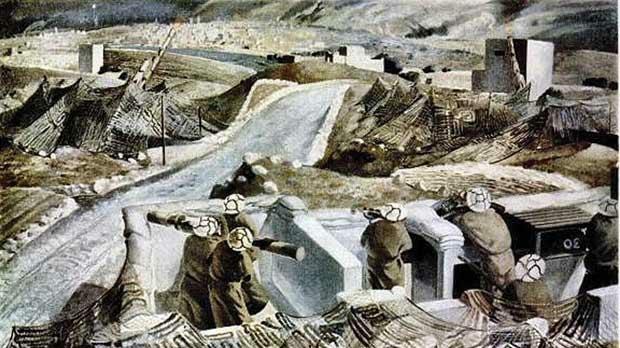 A camouflaged bomb dump in Malta, 1943, 1943, watercolour. The Buff’s company billet at Ta’ Kali, Malta, 1943, watercolour. 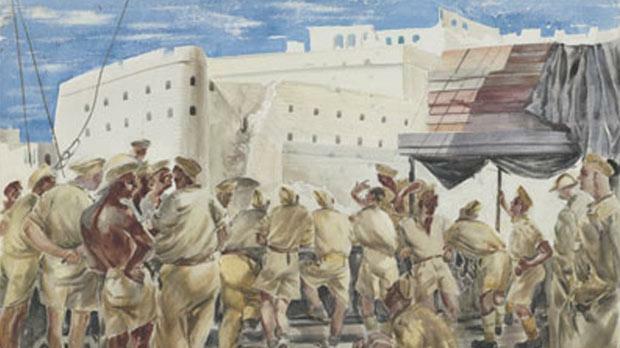 Evacuating the Street of the Immaculate Conception, Senglea, Malta, 1943, watercolour. The harbour barrage from the Upper Barracca, 1943. 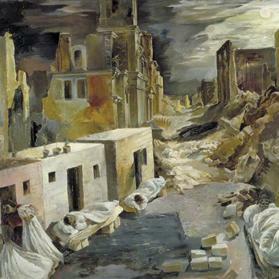 Malta: A few people sleep out among the debris, 1943, oil. Malta: The harbour barrage from the Upper Barracca, 1943, oil. Malta: Gunners resting between alerts at a heavy AA post, 1943, oil. 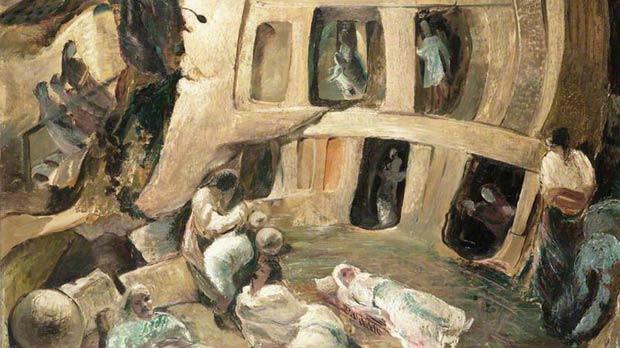 Malta: The Hypogeum: people of Paola sheltering during a raid, 1943, oil. Malta: Fighters take off from Luca’s bombed runway, 1943, oil. Major-General W.H. Oxley, CBE, MC: General Officer Commanding Troops Malta, 1943, oil. Brigadier Ivan de la Bere, OBE: in charge of troops during the siege of Malta, 1943, oil. Air Vice-Marshal Sir Keith Park, KBE, CB, MC,DFC, Air Officer Commanding, Malta, in his ’plane, 1943, oil. Major-General G C Kemp, CB, MC, 1943, oil. The REs leaving Malta after three years, 1943, watercolour. Illustrious returns to the Grand Harbour, Malta. Ten Heavy Ack Ack, Żebbuġ, Malta.